Chapter Three - "Who Are You?" The town of Midvale is still reeling from the earthquake that literally and figuratively rocked its foundations. Meanwhile, Kara Danvers is realizing recent dreams she has been having are actually memories of her escaping the destruction of the planet Krypton. She knows she is an alien, but at the same time, she is trying figure out what to do next. Her decisions could change not only her life, but the lives of her friends and family on Earth as well. Kara hears a cry for help from far away. It leads her to a secret laboratory where a Kryptonian named Tan-On is being experimented on by Doctor Stone, who was pretending to be Kara's track coach. Kara helps Tan-On escape, Stone warns the secret agency Level 9 for whom she works that plans have been changed. Meanwhile, Tan-On kills a local man while waiting for Kara to get some of her belongings. The confused extraterrestrial girl runs away with Tan-On as Level 9 puts Code 777 into effect. 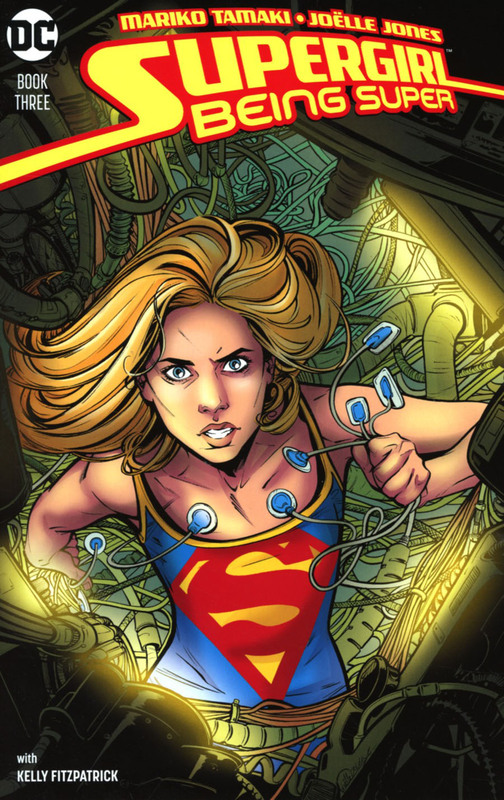 Story - 5: Mariko Tamaki has written a good story for Supergirl without making it seem too much like a copy of what's gone on before. I'll be sad to see this series end, but I'm hoping it will lead to Tamaki writing other DC superheroes in the same style she's used for this book. I'd love to see how she handles Superman, Batman and Wonder Woman. A version of the DC Universe in the hands of Mariko Tamaki and Joëlle Jones would be great reading for me. One thing I really especially thought stood out in this chapter was the insight we got into the Danvers family. Why Kara's parents are the way they are instead of being carbon copies of the Kents. The scene where Kara saved grandpa and grandpa's resulting paranoia was gold. It also shows that everyone handles an adopted alien differently, and not everybody is Jonathan and Martha. The overall experience reading this comic and the entire series so far has been a pleasant one. I look forward to the conclusion, but at the same time, I don't want a book this good to end. Art - 5: The team of Mariko Tamaki and Joëlle Jones really has its act together in ways few modern creative teams have. If they continue at this rate, they could be remembered down the road alongside some of the greats like Marie Severin, Louise Simonson and Jill Thompson. Cover Art - 5: Both interior and cover art are superb and work perfectly for the perfect story that is in this mini-series so far.